In an age of big talk, extravagant promises, the art of the over-sale, the lack of subtlety or humility or restraint, Advent’s promises – quiet and soulful, although ultimately richer in things that matter than any other promises we’ll ever hear – seem like mere weaker versions of so many Times Square video boards or politicians’ carnival-barking routines. 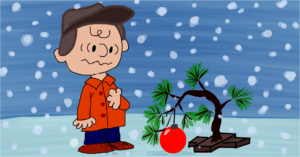 Worse, because we’ve already seen “A Charlie Brown Christmas” about 43 times, we’re even becoming immune (mostly) to the charm and inspiration of Linus taking the stage to tell us “what Christmas is all about.” When we already emotionally discount the very path out of cynicism, well… that’s like being in a wilderness that doesn’t bloom. God understands this, too. God understands when we sometimes lose a capacity for wonder and an openness to joy. He understands the emptiness of the doldrums. It is specifically for those situations that Isaiah tells us to “Strengthen the weak hands, and make firm the feeble knees.”…. For the whole column, read here.